EDMOND—Laughter and pleasant aromas fill Karla Boone’s kitchen as she gathers with some of her favorite people to cook delicious meals together. among others, across the state, but she wanted to make a difference in someone’s life rather than having some fun for a couple of hours, which she still does and enjoys. 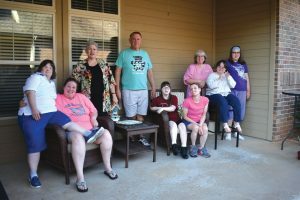 Boone then took action and came up with the idea to host a cooking class for those with special needs at her home in Edmond. “Learning life skills is so important for people with disabilities. It helps them to become more independent,” Boone said. In her six-week, weekly cooking class, Boone focuses on teaching how to create nutritious meals without needing help from others, among other life skills related to cooking. During class, all of the cooking is done on George Foreman grills. Boone and those who attend her class make a photo recipe book without any words, only using pictures. Their photo recipe books show each student how to prepare each recipe, step-by-step. The recipes are also color coded, to make them easier to find. Another student made dinner for her dad, and he said it was the best grilled cheese sandwich he has ever eaten. The student had a smile on her face for days. ‘Happy Birthday’ is sung as a birthday celebration takes place, one of the favorite activities of the class. Another thing Boone does is “Girls Night Out” or GNO. 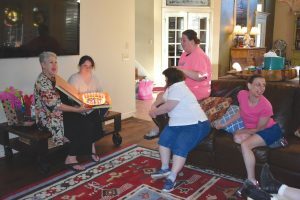 Once a month, Boone and her friends gather together in her home to enjoy a night of fun. The schedule consists of greeting time, washing hands, help make food such as personal pizzas, eat dinner, make a craft or celebrate birthdays, then they watch a movie. Boone selected these girls from different special needs organizations she has served. Some girls know each other, and some girls didn’t know anyone, but that has all changed. Boone said the girls interact with each other and talk constantly, laughing and helping each other cook and craft along the way. One of the favorite activities of the girls are birthday parties. Boone noted how some of the girls had never had birthday parties outside of their immediate family, with no girlfriends to invite. That isn’t the case anymore. GNO has enabled the girls to have a group to which they belong, spend some time independently away from their parents and be accepted for who they are.